Eat grasses, herbs, bark, roots and sedges (a large family of flowering plants). The large incisor teeth help it to dig burrows and tunnels ad to chew on very tough vegetation. It takes two weeks for a wombat to digest its food. The predators are Dingoes and Tasmanian Devils. Move very quickly (up to 50 km/h) which they can maintain for several minutes. 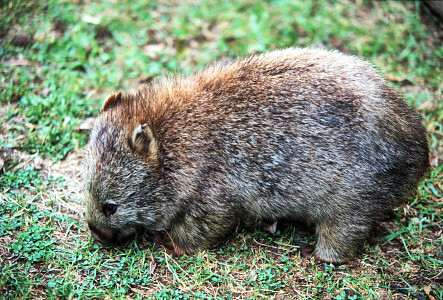 Most Australians have never seen a wild wombat. Before being protected by law, wombats were hunted for the value of its fur pelt.